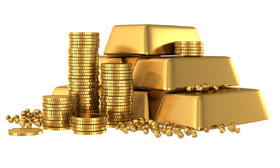 Gold Monetization scheme allows investor and jewelers to deposit physical gold with banks. You can deposit any unused or broken jewelry into this account. This facility allows investor and jewelers to earn additional interest on gold. Investor or jewelers can also borrow money using this account. Draft for gold monetisation is released by government recently. As per guideline given in draft following rules are applicable for gold moetisation scheme. Gold collected from customer will be send to test center for checking of purity level. Once test is completed, customer can either deposit this gold or take it back by paying minor fees. Principal and interest value will be valued in gold. If customer deposit 200 gm gold and get 1 % interest, then maturity has a credit of 202 gms.